Summary: With the first 14000 ft freezing level of the year finally arriving in July, it was time for my almost-annual ski trip up the Emmons-Winthrop route. With a primarily north-facing aspect above 13600 ft and NE-facing below that, it's hard for the snow to soften up high at any lower freezing level. So I've always waited for a forecast of 14K combined with light winds, and had pretty good luck with that the previous 5 times I've skied the route, all in July. Not so this time. 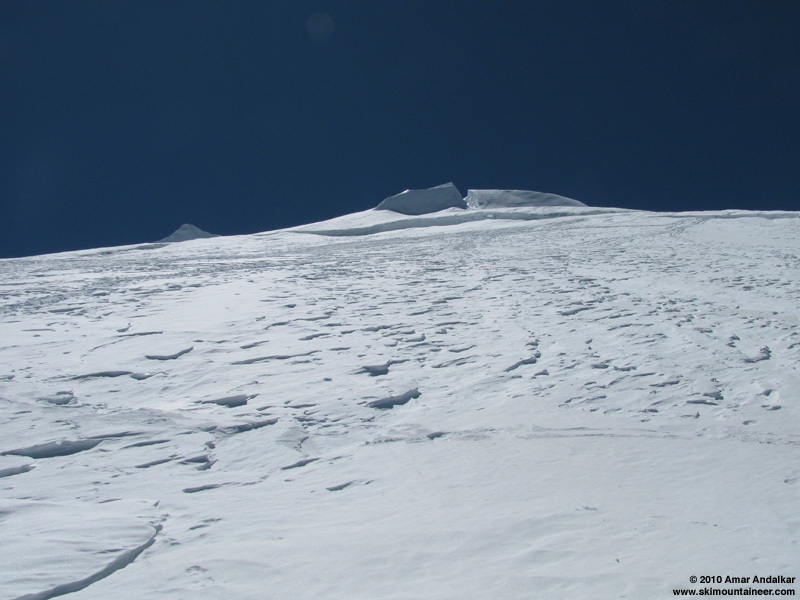 Snow coverage remains excellent and crevasse hazard is minimal, but snow quality was not as good as expected: the route is quite wind-hammered above 12000 ft and not smooth at all, 4-6" high sastrugi in generally table/room-sized patches. Much better snow below 12000 ft on the Emmons Corridor, although as usual the Emmons boot pack is a chaotic stampede path over 100 ft wide, so the only smooth snow and good turns are near the edge of the Corridor, often near crevasses. (Why can't climbers on the Emmons produce a single nice bootpack like they do on the Ingraham Direct and DC??) 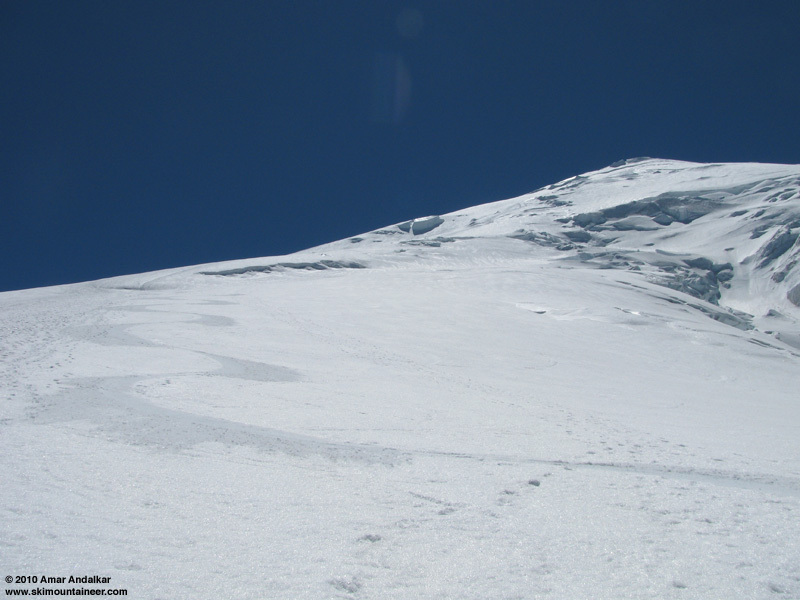 The Inter Glacier remains smooth and nice above 7500 ft, but the basin below 7000 ft is heavily suncupped and runneled. Zoomed view of the Emmons-Winthrop route from about 10000-14000 ft, with the best turns of the day at left. Details: Left White River at 4:30 pm for a quick overnight solo trip, after chatting with several skiers returning from the summit. 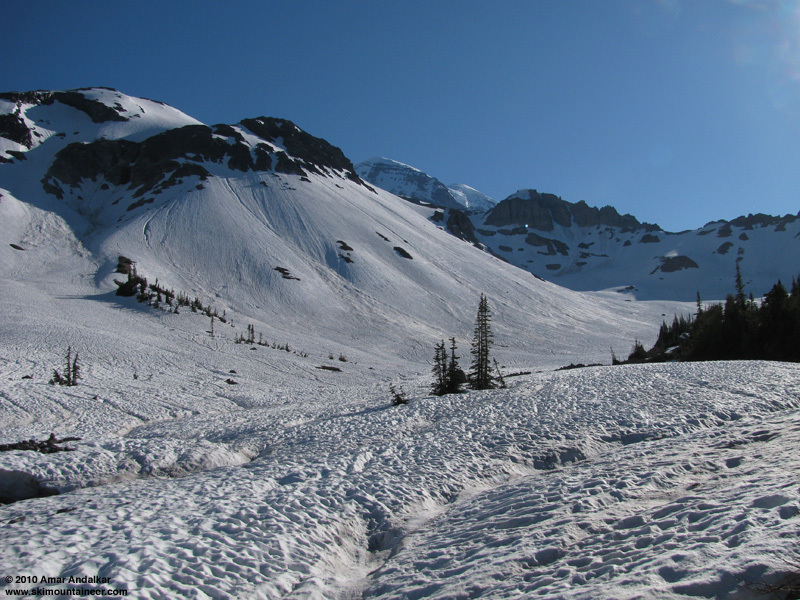 The Glacier Basin trail is mostly snowcovered above 5500 ft (about 2.5 miles), but not really worth skinning due to several long bare patches plus bare creek crossings/bridges. Skinned from just after the camp at 5950 ft, on very runneled and deeply suncupped snow, quite annoying to skin, but certainly better than being on foot. Suncups and runnels atop the Inter Fork White River beside Glacier Basin. 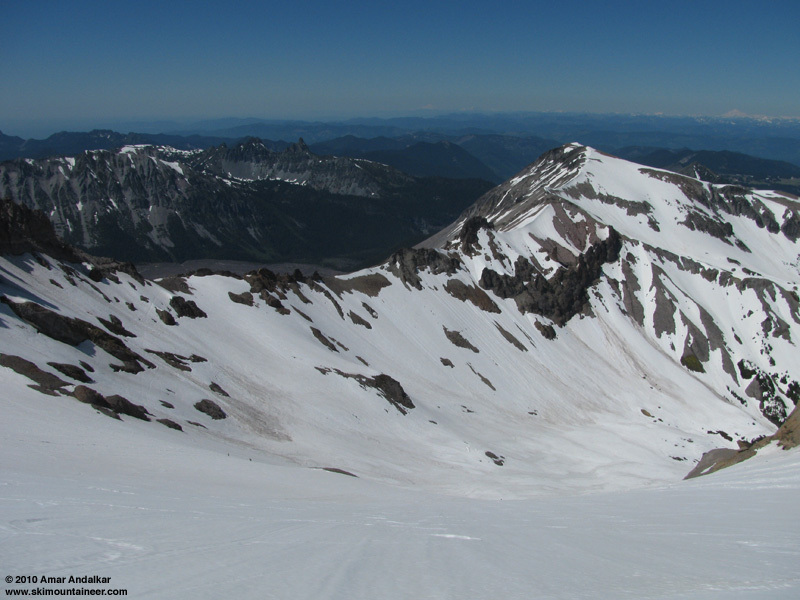 Snow eventually smoothed out above 7000 ft on Inter Glacier. The Inter-Emmons crossing at 8900 ft is thankfully still all snow, but loses about 80 ft (a much flatter route is still possible on snow, but that's not the current track). 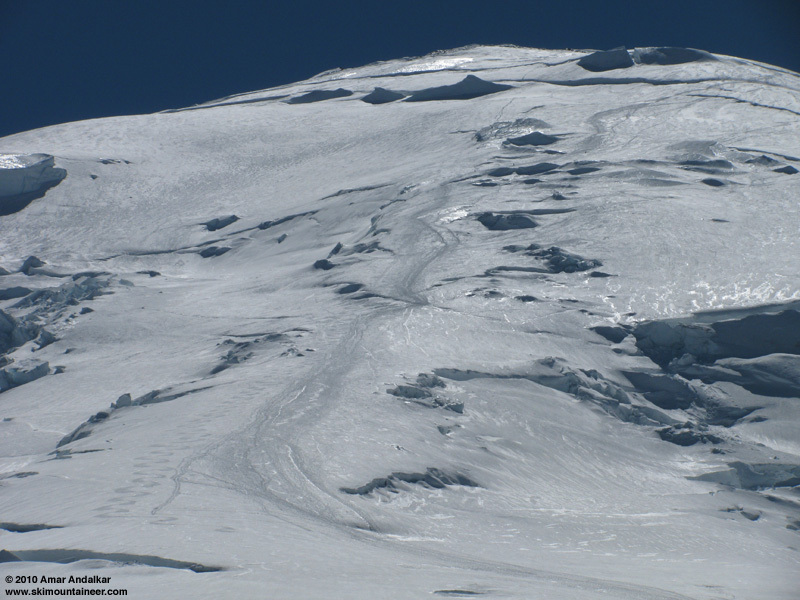 Minimal crevasses on the Emmons up to Camp Schurman at 9450 ft, much better than most Julys. 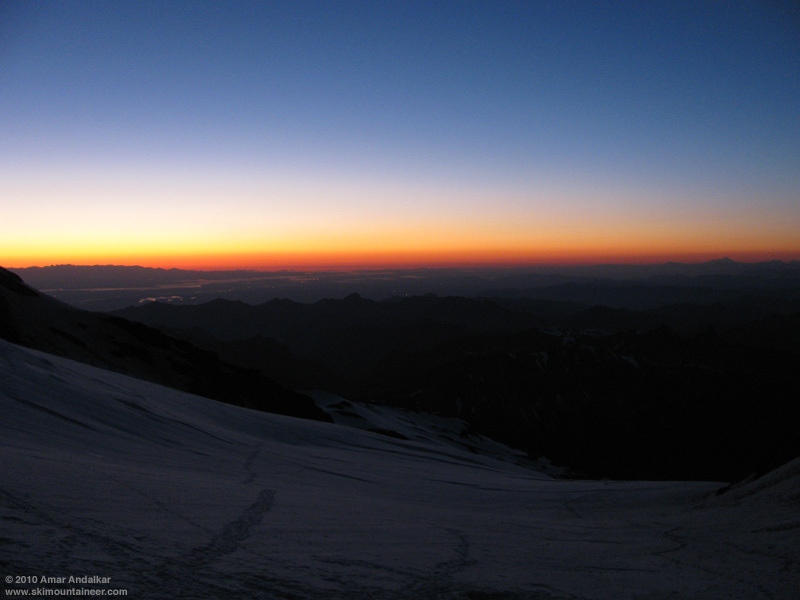 Reached camp in a light breeze at 8:40pm, in time to enjoy a nice sunset and melt a few liters of snow before dark. 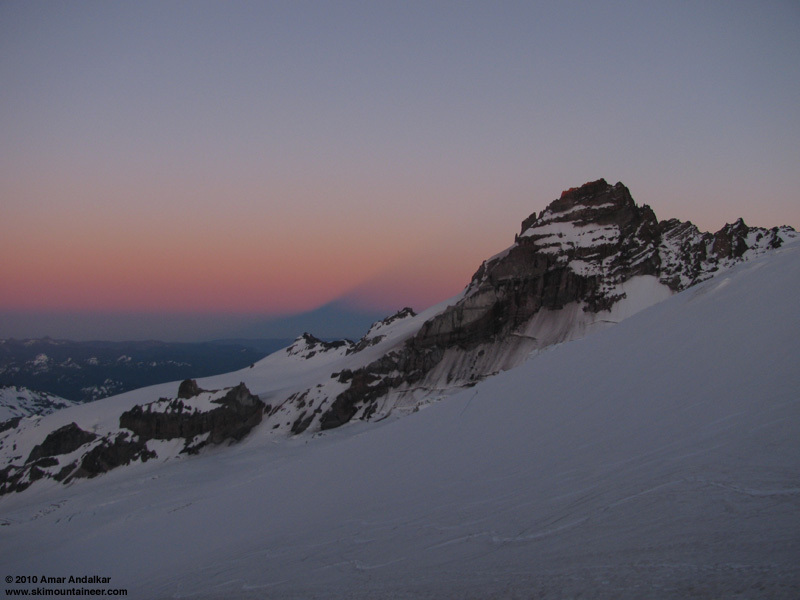 Sunset on Little Tahoma with Rainier's triangular shadow. Twilight and a rainbow of colors above Puget Sound. And then the winds picked up around 10pm. A gusty easterly flow, tearing through camp at perhaps 30mph, not predicted by the forecast. Not fun for me with no tent or bivy sack, just a sleeping bag atop a Z-Rest, as fine wind-driven pumice soon infiltrated everything. Among the cacophony of wind-related noises, I heard something that sounded distinctly different, like a rodent scurrying and chewing -- in the morning I would find a ragged hole in one of my hiking socks, but luckily my hiking boots, ski boots, ski socks, and pack (including all food items within) were untouched. Dawn came all too soon before 5am, and the wind showed no signs of abating. I stayed huddled in my bag until after 6:30am, certain that an early start was not needed today, until finally the winds eased slightly and it was worth coming outside. Blinding sunshine as usual at Schurman, feeling much later than the actual hour. I felt exhausted and drowsy after the mostly sleepless night, although perhaps I had eked out a couple of hours of sleep in a few bits and pieces. Rise and shine, belatedly: looking up the Emmons long after sunrise. Finally got everything ready (including dumping the pumice sand out of my pack) and skinned uphill with ski crampons just before 8am. Decent skinning conditions if you stay right or left of the bootpack on smoother snow. Made quick progress up to 11900 ft, where the snow had incrementally become firmer and the route then became significantly steeper. Switched to cramponing on foot the rest of the way, and progress slowed dramatically. 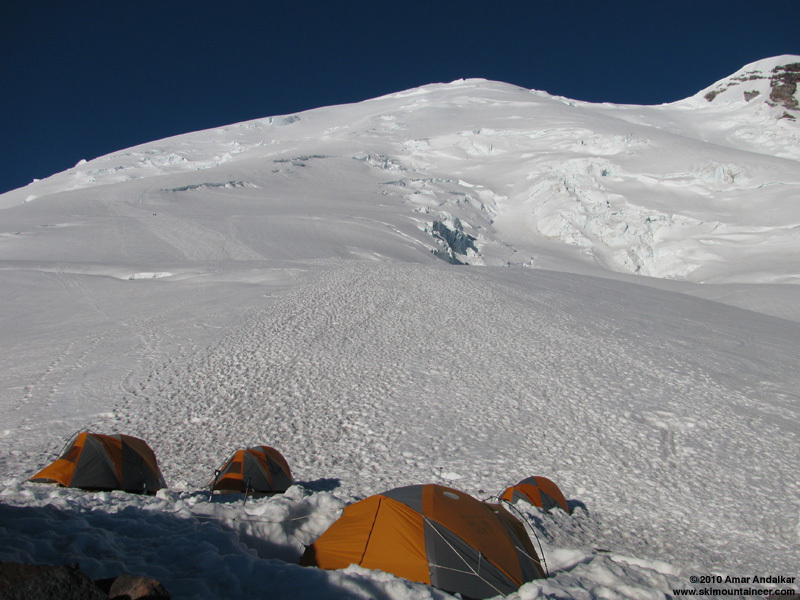 No easy cruise this time like it was last year (July 1-2, 2009, Mt Rainier, 3 Summits via Emmons). I was exhausted and needed to fall back on all the standard tricks (rest stepping, pressure breathing, etc.) to push myself to the top. Not much fun on the last couple thousand feet, especially since the masses of climbers had failed to produce even a single acceptable bootpack or a set of proper steps among the hundreds of random interweaving tracks. At least the weather was glorious, totally sunny, and fairly comfy despite the persistent SE breeze of 15-20 mph. 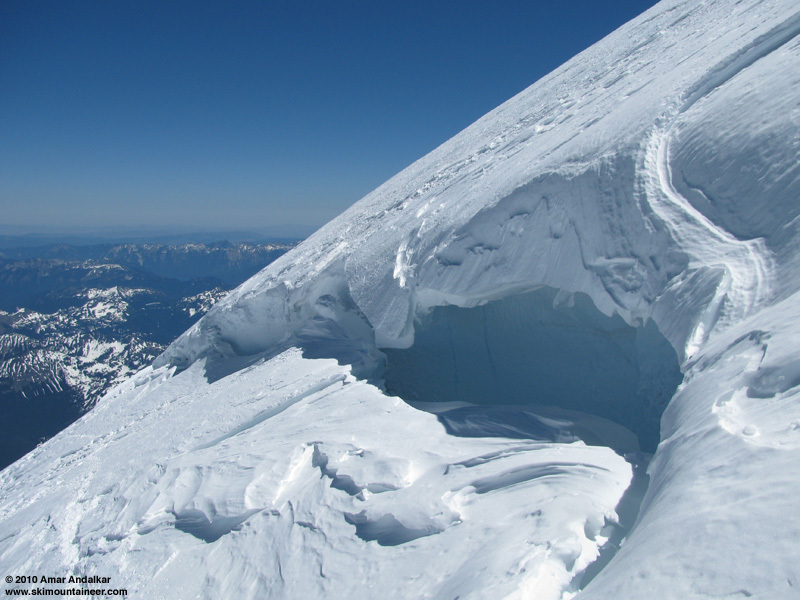 The route crosses a few obvious crevasses on solid snow bridges, including the bergschrund near 13600 ft which contains a huge hollow room inside. Looking into the bergschrund near 13600 ft, revealing a huge hollow room under the snow bridges. Topped out on Columbia Crest just before 1pm, the continuing cold breeze keeping things quite chilly despite temps above 30 �F. Met a pair of snowboarders who had come up Fuhrer Finger, they said they were inspired by my TR from late June. I was worried that the Emmons would not have softened properly due to the breeze, despite the 14000 ft freezing level, but also did not think that waiting another hour on the chilly summit would help. 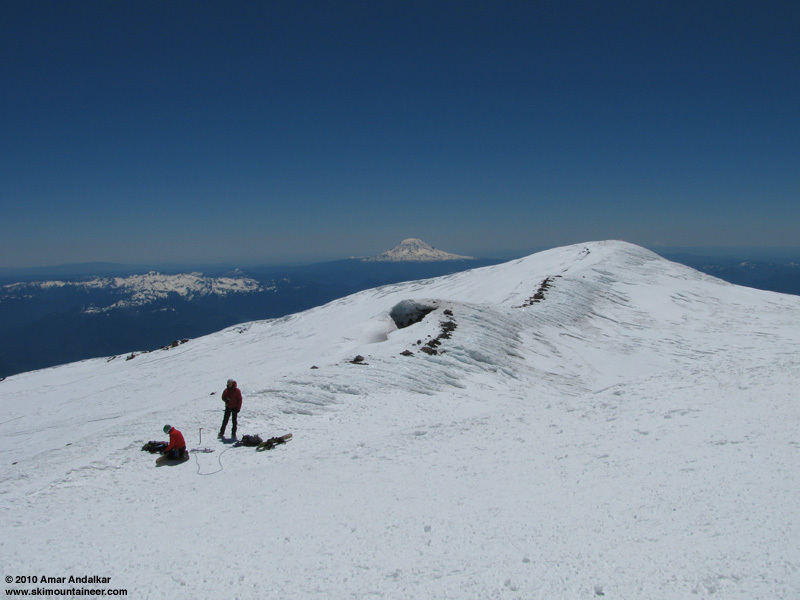 Looking south from Columbia Crest, with Mount Adams in the distance. Skied down at 1:30pm, as expected the upper parts had not softened and the skiing was not very good, on very firm windpack and broad tables of sastrugi. Snow conditions could certainly be much worse up here, at least there was no bare ice or shark fins. But even farther down, nearing 13000 ft and even 12000 ft, the snow stubbornly refused to corn up. Just endless firm snow and windpack, with way too much sideslipping and traversing mixed with an occasional nice turn or two. I had hoped to ski the Winthrop Corridor instead of the standard Emmons route, but just didn't feel comfortable dropping solo down that isolated variation, especially as a number of cracks are starting to open on its toe, at the exit just above Camp Schurman. The cracks are not really that bad, I would have skied that for sure if I had a partner this time. Not so smooth sastrugi above 13000 ft. Eventually, below 12000 ft, the snow did soften and turn to corn. The best turns of the day would be from 11500 ft down to camp, really nice smooth corn, although a bit too soft down here at 2pm. But no complaints at all after the marginal conditions higher up. Considered taking a long nap at camp, but decided to just pack up and head down. Nice smooth corn near 10000 ft. Nearing 3pm, the Emmons below Schurman was total slush and mush, which certainly did not bode well for conditions on the Inter Glacier. Put the skins back on for the 80 ft ascent up the boot pack to the Inter. Then skied some extreme deep mush, setting off a few rollers as I carved foot-deep trenches, but then surprisingly the snow improved below about 8500 ft, probably due to greater consolidation lower down. Stayed to skier's right on the smoothest snow, and managed to carve some nice turns in the oversoftened corn, despite it being 3-4 hours past its prime for the day. Then plowed through the deep suncups and runnels below 7000 ft back to the edge of the Inter Fork White River at 5950 ft. Thought about skiing the various patches along the trail below Glacier Basin, but decided to just switch to hiking boots and hoofed it back to the car by 5:30 pm. A magnificent sunny day on the Mountain, but an exhausting one for me due to the overnight wind and sleeplessness. About 10500 ft of total gain for 8600 vert of skiing, ranging from very good to very mediocre, in about 25 hours car-to-car. Surprisingly, I appeared to be the only skier on the route this day, after several skiers had done it the previous day. SYNOPSIS...A DRY AIR MASS OVER WASHINGTON WILL WARM SIGNIFICANTLY OVER THE NEXT THREE DAYS. THERMALLY INDUCED LOW PRESSURE WILL SPREAD NORTH THROUGH WESTERN OREGON THIS AFTERNOON. THE THERMAL TROUGH WILL EXTEND FROM THE OREGON COAST TO VANCOUVER ISLAND WEDNESDAY AND THURSDAY THEN SHIFT TO EASTERN WASHINGTON LATE IN THE WEEK. RECORD HIGHS ARE POSSIBLE IN SOME PLACES WEDNESDAY AND THURSDAY...WITH SOME COOLING LIKELY BY THE WEEKEND. TUESDAY...SUNNY. FREEZING LEVEL 12000 FEET. TUESDAY NIGHT...CLEAR. FREEZING LEVEL 13000 FEET. WEDNESDAY THROUGH THURSDAY NIGHT...SUNNY DAYS AND CLEAR AT NIGHT. FREEZING LEVEL AROUND 14000 FEET. FRIDAY THROUGH MONDAY...SUNNY DAYS AND CLEAR AT NIGHT. FREEZING LEVEL AROUND 14000 FEET. "Why can't climbers on the Emmons produce a single nice bootpack like they do on the Ingraham Direct and DC??" ditto .. this even fm a climber .. I'm glad your ski went well. We also had firm conditions right off the Summit. The snow was a bit softer on the Nisqually and the Finger was perfect. The snow was soft enough for great turns with no significant wet slide or rockfall activity. Here are some shots I took along the way. I passed you on the way down. You looked like you were in a hurry , so we just exchanged quick hellos. Going up the Interglacier, the boot pack was superb. It is very annoying trying to follow numerous boot packs on snow. Sometimes people just don't have a clue. Cool stuff Amar, thanks for the report. Anyone ever call you Amar Animalkar? You are a climbing and skiing animal- meant in a complementary way... It must be nice to be at a level of fitness that allows you to do what you do.